Palawan has various flora species that are endemic to the province and are being protected by the efforts of the government due to deforestation and over-harvesting. Palawan has 42, 500 hectares of mangrove forests composed of 31 species of mangroves and 90 % of the known mangrove species that is found in the Philippines. 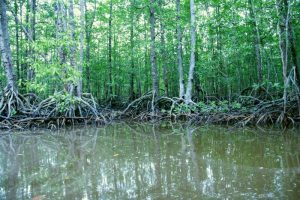 Mangroves are a special woody type of trees that are found in tropical countries and grows on the edge where rainforests meet oceans. They grow in brackish wetlands between land and sea where other plants can’t grow. They are those who are tasked to protect the coastlines and to prevent erosion by collecting sediments from rivers and streams which slows down the flow of water. In Puerto Princesa in Palawan, the City Government have given efforts in sustaining the mangroves by planting mangrove seedlings annually in an event called “Love Affair with Nature” which is still being observed until today. The Kabantigi or Pemphis Acidula is grown as a small tree or as a shrub and can reach heights of up to 33 feet. They are typically low-lying and are densely branched. It flowers in the spring with inconspicuous blooms. They are frequently trained as bonsai trees especially in Asia. The wood from this tree is highly prized by wood carvers because it is heavy and possesses a naturally twisted shape. These trees are not common but may be found along coastal rock areas, gravel, and sand. Bungang-ipot is a plant from the “Palmae” family and has the Scientific name is Areca ipot Becc. Bungan-ipot is a small stocky tree that is 4 meters high and is 12 meters in diameter. Its dark green leaves reach up to 1.5 meters in length and are gracefully curved outwards while its trunk appears to be swollen near its base. Its flower arrangement is dense with a cluster of flowers. Its deep orange fruit has a flattened base and a rounded top. Its seeds are oval in shape; natives use the nuts of this tree for betel-chewing. It is found in forests at low and medium altitudes. Its conservation status is threatened due to the threats imposed by the over-collection of this plant for ornamental purposes. Almaciga which is also known as Dayungon or in its Scientific Name Agathis Philippinensis is a tree that is native to the Philippines, Sulawesi, and Halmahera, and occurs in upland tropical rainforests at 450 to 2,200 meters altitude but may also be found in areas with low altitudes of 250 meters in the northern Luzon. Almaciga is a large coniferous evergreen tree that grows up to 65 meters tall with smooth, grey coloured bark. Its leaves are about four to six(6) centimeters long and 1.5 to two(2) centimeters broad oval in shape. For young trees, the leave is slightly larger and reaches up to seven(7) centimeters long and three centimeters broad. The seed cones are squat ovoid, and is about seven (7) to nine(9) centimeters in diameter, containing numerous spirally arranged scales of 28 to 32 millimeters long and 35 to 45 millimeters broad; with each scale bearing a single winged seed. Almaciga’s pollen cones are 25 to 45 millimeters long and 10 to 11 millimeters broad. The Almaciga tree is commonly used throughout the Philippines, Melanesia, and Australasia as an enrichment crop. Despite being limited by altitude constraints, it is tolerant to most different soil densities, though, it requires good drainage and prefers acidic soils. It has a special tolerance for shallow, infertile soils. The tree is therefore used to support areas which do not experience adequate crop growth and is also planted inside of existing plantations to replace existing trees. Orchids (Scientific Name Orchidae) are aerial plants that have become famous as ornamental plants that are either used as home decorations or photographic subjects. Orchids are a diverse and a widespread family of flowering plants with often colourful and fragrant blooms. Along the Asteraceae, they are one of the two largest families of flowering plants with between 21, 950 and 26, 049 species that is currently recorded. The orchid family includes Vanilla, Orchis, and many commonly cultivated plants such as Phalaenopsis and Cattleya. Moreover, since the introduction of tropical species into cultivation in the 19th century, horticulturists have produced more than 100,000 hybrids and cultivars of the orchids. In Palawan, one species of orchids have become a major eyecatcher due to its characteristic. Pholidota Imbricata is an orchid that can be found attached to limestone rock crevices in the Miniloc Island in the municipality of El Nido. 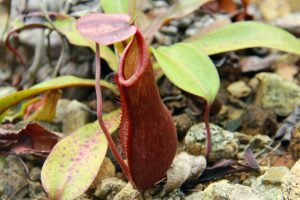 Nepenthes Palawanensis is a tropical pitcher plant that is endemic to Sultan Peak in the island of Palawan in the Philippines. It grows at elevations of 1,100 to 1,236 metres above sea level. This species appears to be most closely related to N. Attenboroughii, which grows on a nearby mountain called Mount Victoria. N. Palawanensis may be distinguished from N. Attenboroughii with its pitchers which are remarkably larger than that of the N. Attenboroughii. Its pitchers sometimes exceed 35 centimeters in height and have a capacity of 1.5 to 2 liters of water. Its pitchers are lined with orange to red hairs. Aside from the Sultan Peak, this may also be found in Snake island El Nido. It has enzymes that break down animal protein such as those found in insects.